He is conscious that Brexit is creating anxiety. And that one of his jobs is to offer as much reassurance as he properly can. 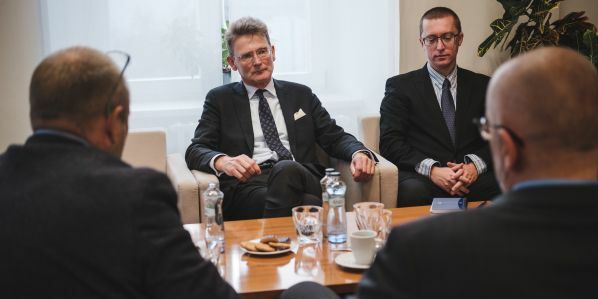 On Monday in Brno, British Ambassador to the Czech Republic Nick Archer discussed the consequences of Brexit for cooperation between Czech and British universities and research institutes. Read the interview in Czech translation. According to Nick Archer, the British Government is keen not to do any damage to cooperation and partnership in higher education and research. “We see no need for cooperation and partnership to be damaged,” Archer says. We meet in Brno, where you have met representatives of universities and research institutes. Now that Brexit negotiations have again been delayed, at universities and among researchers we see uncertainty and a little anxiety about how things might develop. Did you discuss the consequences of Brexit for cooperation between Czech and British universities and research institutes in Brno? We have already made a couple of unilateral offers to students and, in relation to research funding, given people a degree of reassurance during the transition period. Because we think a lot of the worries are about this change from one system to a different arrangement. But we are determined that in the longer term we will continue to build up our partnerships with European universities and we continue to build overseas student numbers in the United Kingdom. So, you do not assume that connections between the UK and continental universities will be weaker after Brexit? No. On the contrary. If you are looking for a positive dimension of all this, Britain has been obliged to think again about its relationships with individual countries and what it values. I am in charge of an embassy that has a bigger budget and more people than it did a year ago. Precisely in order to say something positive about the future of a specifically Czech-British relationship. And actually science, technology and academia are very important to us, because the Czech Republic is strong in these areas. Could you say more about concrete offers to universities? I said we made unilateral gestures. The first thing we did, was this: without trying to negotiate it, we said the status of all European Union citizens either in Britain now or going to Britain during the forthcoming anticipated transition period from Britain in Europe and Britain out of Europe is guaranteed. Nothing will change. So, no problems for Erasmus and other students who are in the UK now and going there in 2019? No problems for those, no problem for those who will be going in early 2020. That’s on the basis that we get a deal and we have a transition period. And that’s what we aim to do and want to do. But if there is a no-deal Brexit and Britain leaves the EU without an agreement? Recognizing that people are talking at the moment about the possibility of no-deal, we promised further, and made it clear, that all EU citizens in Britain will have their current status preserved, even were we to crash out with no-deal. We have also made some commitments in relation to research funding – which effectively ensure that if EU funding of joint projects falls in the short term, we will backfill it by bilateral funding short-term. This is all about the transition from where we are today to where we shall be long-term. When you look long-term, to after the end of the transition period, let’s say after 2020, what do you think can we expect? Things will change because in response to the desire evidenced by the referendum vote to take back control of our migration policy we will be dealing with EU students much more in the way that we deal with Australian or New Zealand students. There will be more parity between students from developed economies outside the European Union and students from developed economies within. But that’s not about eroding the privileges of EU students today. It’s probably going to be about effectively giving wider access to their privileges. People in Britain tend to look to Australia and they see people like us. And they say, why do EU students get better than Australian students? What we are looking ahead to will be a situation where everybody gets that access. Because, to repeat the point, we cannot be without internationalized universities. Forgive me, but the transition period still brings a lack of clarity. What would you say to EU researchers and universities? There are always, I think, problems with transitions. You move from a certain set of arrangements to a new set of arrangements, however close they are to the old ones. My message will be: not to worry too much. Look at the logic of it all, which is: Who benefits from discrimination? Who benefits from the less liberal arrangements we have today? And the answer, I think, is nobody. What do you personally think about the consequences of Brexit? Once we get through this short period of anxiety, and once we have clarity about what the future will look like, there is every reason to suppose that first of all Britain can flourish. Because we are, after all, the fifth biggest economy in the world and we do have a different geography and history from the rest of the European Union member states. We have an opportunity to do what we are doing – that is to leave the EU and thrive – which does not exist, I would suggest, in the Czech Republic. But once we have control of our destiny, which is what the voters wanted, then we have the opportunity, actually, to be very liberal in terms of welcoming foreigners, because we know the decision is ours. And we certainly have the opportunity to build relationships with individual EU member states. That really goes into the special and positive aspects of the relationship. Not just for this audience, but I constantly go back to science and innovation. There is huge respect in Britain for the Czech engineering and research tradition. We have very strong ties already and my task is to maintain those ties through the turbulence to be in a good shape at the far end.